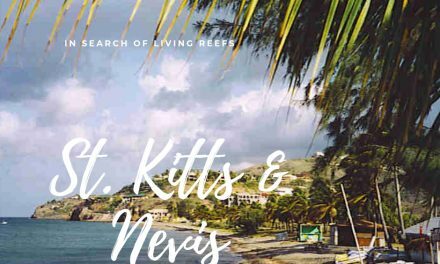 Experienced Caribbean travelers generally prefer to avoid heading toward the equator in the heat of July. However, the timing of our visit was determined by our Bahamian friend living near us in Florida, who invited us to join her for a family reunion on the island. The event was scheduled for the week of July 4, so off we went, in planes that decreased in size and became hotter and more cramped as we traveled from Tampa, Florida to Miami to Nassau, and then on to Long Island. 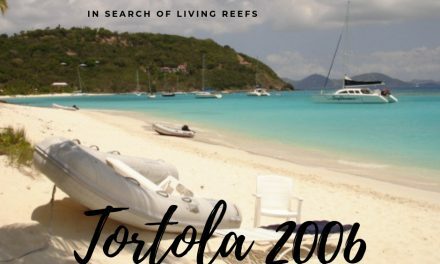 On our previous visit, we’d experienced Long Island in the heat of May, which is off season, where we had enjoyed the relative luxury of the Stella Maris Inn resort situated at the northern tip of the island. 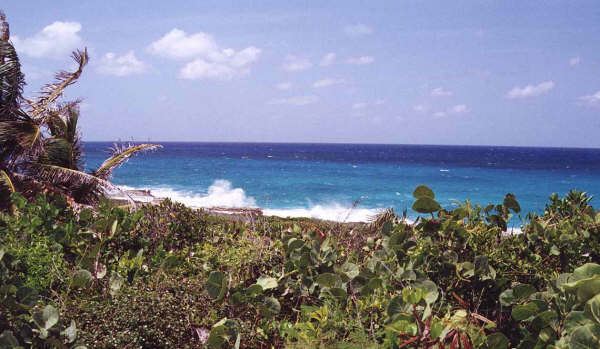 Ocean view, Stella Maris, Long Island, Bahamas. This trip we looked forward to “Livin’ Like The Natives Do”, discovering local hangouts and foregoing expensive resort amenities.Our destination was one of only two airstrips on the island- the one closest to Cartwrights, the settlement named for our friend’s family, where I hoped a rental car awaited us. Arriving on Long Island during a torrid summer mid-afternoon afforded a small taste of the heat and sun we were to endure for the week. But hey, we were used to the heat so we came prepared. Of course the (high-mileage, beat-up, standard shift) rental car had no air-conditioning but it did have fairly new tires, very critical to getting around on the extremely rough, boulder-strewn and potholed limestone gravel roads that crisscross the island. It is worth noting that the island is a bit over 100 miles long, with one major asphalt road (The Queen’s Road, which our friend’s uncle helped develop in the 1960s) that runs the length, along the leeward shore of the island. In places the island may be six miles wide. Rough gravel roads that connect from the Queen’s Road to the rocky, windward shore are few and far between, due to the cost of bush hogging and putting in a (typically very steep) road. A consequence is that the beaches are deserted. It also helps that, the year of our visit, less than 5000 people were living year-round on the island, which made it rather sparsely populated. After we collected our little Geo-type car at the tiny airport, we managed to make our way “up island” to hook up with our friend at the new Shell station, one of only two gas stations for many miles. 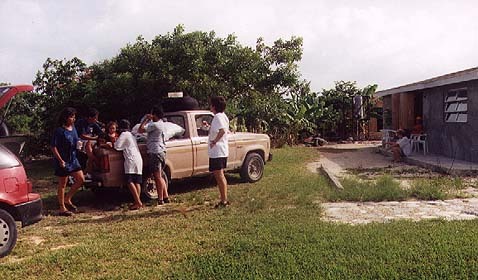 Family truck in grandmother’s yard, Cartwrights, Long Island, Bahamas. Numerous family members had turned out to meet our friend at the airport, and at least five adults and four kids were piled in the family pickup truck, squeezed into the rusting cab and packed into the open bed. After hasty greetings in the broiling sunlight, we formed a caravan and headed down the road, looking like a vanguard from the Grapes of Wrath. We soon arrived at the Cartwright family compound and the home that our host and his wife shared with their two pre-teens and Maw-Ma, the 85-year-old matriarch of the clan. 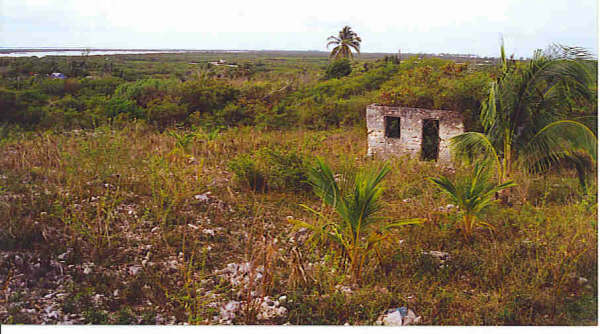 The three photos illustrate the remains of a home circa late 1700s, the ruins of a home from the early 1800s and a 20th century homestead. 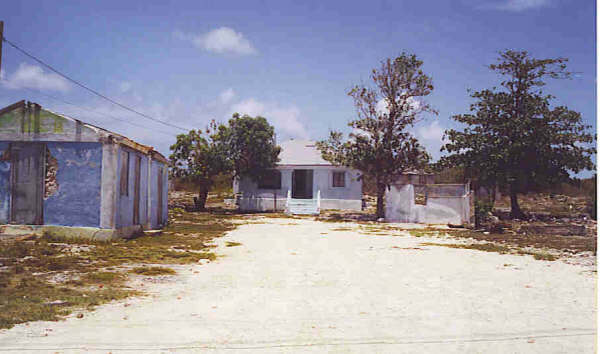 The family home was quite 20th century: a small, unfinished cinder block house, like most homes on the island, situated close to the Queen’s Road and surrounded by several acres of banana and fruit trees. 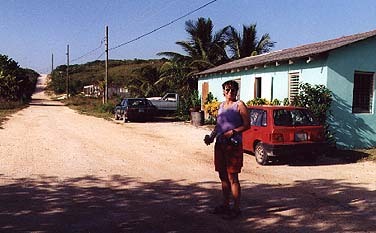 Across the road squatted the little community store, which, during our stay, the clan cleaned out of chicken, soft drinks, bottled water and Vienna sausage until the next arrival of the island supply boat. Next door was an uncle’s house and down the road was Aunt So-and-So and Cousin so-and-so and on it goes. Living on an island means making-do and learning to live with little or no access to services and amenities to which we in the States are accustomed. One must wait for the weekly mail boat to arrive, which brings car parts, machinery, doors and furniture and the like. There are finite limits to what the boat can bring, and to what people can afford. Thus, it’s very expensive to purchase many items that we take for granted, like clothing or shoes or floor mats or nails. Example- a plastic patio chair retailing here for $4.99 is over $17.00 there. Most of the vehicles are pretty old and beat-up. It costs thousands to ship a vehicle to the island, after having bought it typically very used, in Florida. Upkeep is sporadic, parts unheard-of and very expensive, so many vehicles are cobbled together and in extreme states of wear and tear. In fact, the family truck broke down trying to climb one of the steep, rocky tracks on the windward side of the island. Luckily, we were following the truck in the little rental car, and were able to run “up island”, or south, to find a relative with jumper cables. Once underway, the truck had to be backed up a steep incline in reverse because it only ran forward in third gear. With a few people pushing, the truck got over that hill. That was the end of visits to the rocky shore in the truck! As for their homes, island residents build as they can afford, so it typically takes a few years to complete a house. We observed many cinder block shells about the island, overgrown and apparently abandoned, but we were informed they were merely “under construction”. This was the first time our friend had been back to her home since she was ten years old. She was excited to be back and to show her own children where she had grown up and attended school. A real treat for us was to watch her interact with her family and revisit her childhood haunts and activities, like clawing around in the cave system that, for generations, has protected island families from hurricanes. Cartwright’s cave, a necessary hurricane haven. Long Island, Bahamas. Our friend managed to locate carvings and scratching made by members of several generations of her family, and we even teased her uncle about a decades-old carving we discovered that advertised his attraction for a long-forgotten schoolgirl. We found a goat skull in the cave, and many bats, spiders, salamanders and land crabs. 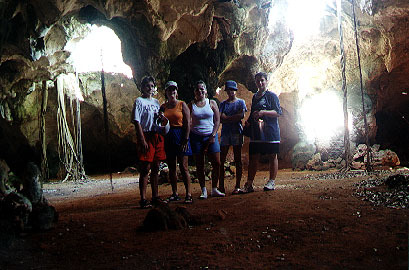 In places it was pitch black, and the damp limestone floor was uneven and slippery — thankfully we had our flashlights. We spent our days and evenings with the clan, providing transport for the beach-or-blue-hole-of-the-day expedition. Because of the heat (and non-air-conditioned homes and businesses), the goal was to find a swimming spot with some shade and to relax for a few hours during the heat of the day, or at least until 2:00 pm when the truck was needed to go to the Shell to pick up Auntie from work. The truck also was needed at 4:00 pm to pick Uncle up from the construction site where he worked, a few miles from the house. While Uncle and Auntie worked during the day, Maw-Ma sat in a breezy, shaded spot by a door or out back near the banana grove, weaving palmetto into strips that she would eventually use to weave hats or straw bags. Her handiwork was beautiful, and a source of income for the family. Maw-Ma would often have visitors, including her elderly sister and her sister’s daughter. The sister was wheelchair bound, toothless and fond of snuff. She wore a John Deere baseball cap and, like everyone else, she wore threadbare clothes (folks wear their clothes ’til they literally fall off their bodies).The elderly sister and her middle-aged daughter were intimidating when we were first introduced– I suppose because we were unaccustomed to being stared at, but we soon realized this is the way of the locals, who apparently find visitors an infinite source of interest and amusement. We soon came to know these women as gentle, simple folk — and hearty! The daughter typically wheeled her overweight mother down the sun blasted Queen’s Road for several miles, to and from these daily visitations. Plus, the daughter was always barefooted, as are all the kids and most of the adults we encountered. We were told that shoes were saved for church, work and school! I have now digressed well beyond our first evening, which found some thirteen of us piled into the truck and the car, slowly making our way to nearby Clarence Town to one of the few restaurants on the island, and the only one open after 7:00 pm on a Saturday. It took a couple of hours for the friendly staff to cook and serve food (chicken, grouper or conch) for the clan, but time flew by as we all chattered and laughed and did our best to decipher the range of accents represented. It wouldn’t be long before we Floridians were speaking in the soft patios and deliberate delivery common to the island. The stars were close overhead and the almost-full moon high in the sky as we caravanned home along the dark Queen’s Road. We were invited to bunk in at another uncle’s nearby house, which proved to be a sleepless night. Amenities like a shower head, a light in the bathroom, a toilet that flushed and screens on the windows were conspicuously missing. We were hot, tired and dirty from a long day of travel and didn’t sleep a wink as we tossed and turned on an ancient, soggy mattress and were devoured by no-see-ums and mosquitoes. Yikes! Tough times for even us, who camp in mosquito-infested areas in the tropics! Of course, we use a tent with fine mesh screens — no such luck here. Sunday dawn found us on the Queen’s Road, having unceremoniously abandoned our host’s home. I drove slowly along the Queen’s road, blearily looking for one of two fishing resorts I knew were in the area. Before too long we managed to locate our home-away-from-home at the Greenwich Lodge. We spoke with the proprietress as she was cooking breakfast for her only other guests, a rowdy group of high-school students from Washington State on a church outing. She was happy to have us check in right away, as we were to be the only guests in this 8-room facility the rest of the week, after the kids departed. Once she knew we were on the island to visit with the Cartwrights, we were treated as family. We were soon happily showering in a brand new motel-like room, one with air conditioning. We caught the morning’s breakfast, which we soon discovered to be grits and something, usually dry scrambled eggs and greasy bacon or, interestingly, tuna salad. No bread. Coffee or juice but not both. Then we took a long nap. By mid afternoon, we were ready to go play with the Cartwright clan. Everyone piled into the car and truck and off we went to what turned out to be one of several fantastically picturesque beaches. Maw-Ma rode with us in the rental car and we had the chance to hear of her stories of being raised on the island with no electricity, before her son put in the Queen’s Road. We learned how many of the settlers, white and black, including her grandparents, arrived at the island. They jumped from their convict ship as it stopped to provision en-route from Puerto Rico to Nassau. Many of these people were poor and had been incarcerated for petty theft (food, mostly). Some were escaped slaves. 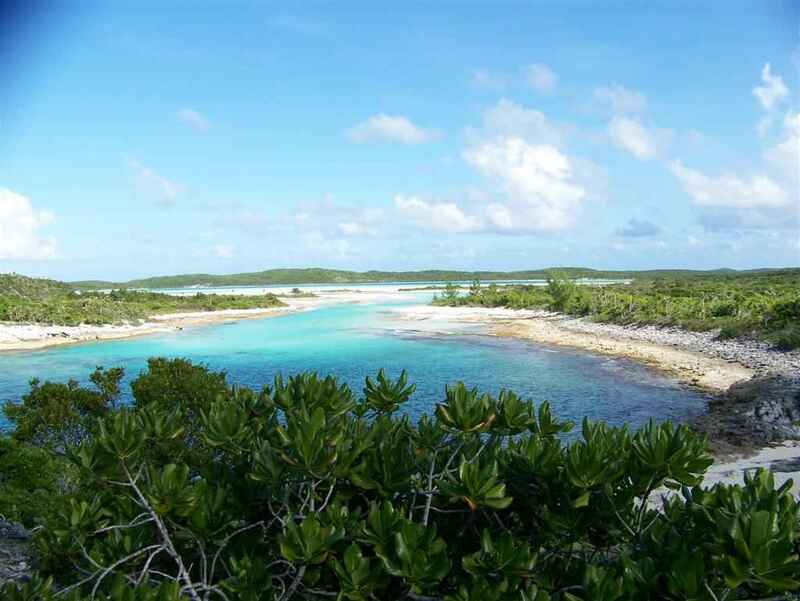 They eventually populated the island and turned it into what is now the breadbasket of the Bahamas. 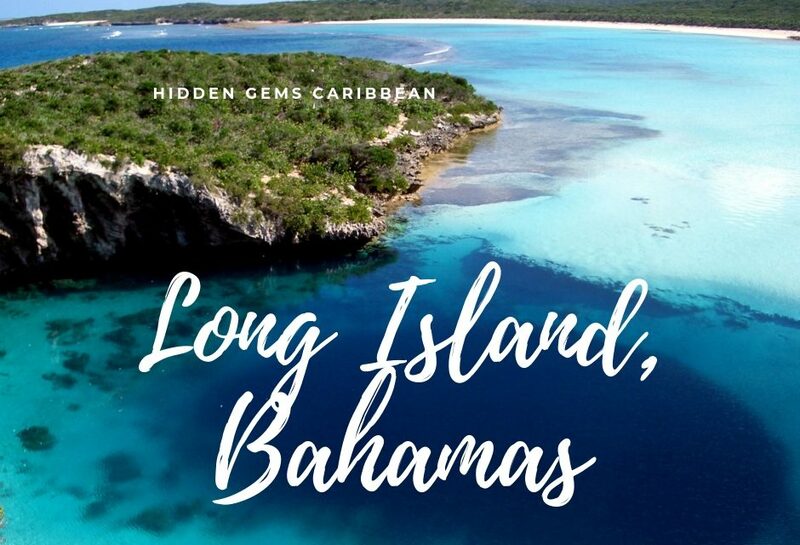 Nearly all of the fresh fruit and most of the veggies served in the Bahamas come from Long Island, which has numerous sources of fresh water, including cave systems, springs and blue holes. Fresh water is what brought Christopher Columbus to the island on a number of his crossings, which is why the west tip of the island and the harbor there are named for him and a monument erected. Columbus Harbor, Long Island, Bahamas. The harbor goes on for miles and is one of the most hauntingly picturesque and pristine areas I’ve ever seen. Except for flotsam and some litter, I doubt it looks one iota different from when he visited. No homes, no boats, no people, no power lines, and only one narrow, dangerously rutted, track of a road. We were captivated by this area on our last visit and were delighted to return, even if the drive was 1.5 hours to the north, or “down island”. Subsequent forays took us to a couple of the island’s blue holes, including our favorite, Dean’s Blue Hole, located on Turtle Cove, which we had visited on our first trip to the island. Unbeknownst to us on our first visit to Long Island, the property surrounding Dean’s Blue Hole is owned by yet another Cartwright family member, so of course this visit we had permission to access this place that the world-famous Jacques Cousteau had made famous by featuring in one of his TV specials. Deans Blue Hole, Long Island, Bahamas. These blue holes are found throughout the Caribbean, but this one is the deepest in the Bahamas, well over 600 feet. Fresh water wells up from below and mixes with salt water flowing from the adjacent protected lagoon, which I thought looked exactly like a pirate stronghold!One day we adults slipped away from the kids and spent the morning at this wondrous place. Our friend and her brother were brave enough to climb up the razor sharp rocks that tower some 50 or more feet above the blue hole. 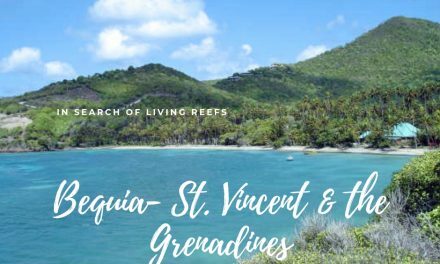 After much egging-on by those of us on the sandy beach at the edge of the blue hole, they each jumped into the crystal clear, cold water below, scattering tropical fish and startling the large Nassau grouper that hung about in the depths below the cliff wall. Lynn at Dean’s Blue Hole, Long Island, Bahamas. Lowes Beach, Long Island, Bahamas. Lowe’s Beach is well known by the locals but seldom seen by island visitors. 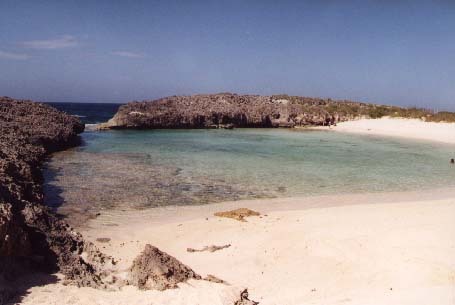 The beach was tucked into a small cove which was protected by a 30-foot high wall of the typical sharp iron shore rock. Here, a section of the wall had been worn down over the centuries, so the ocean waves poured through an opening approximately 40 feet wide. The tumble of rocks found on the lee side of the rock fall had formed a small reef that featured a swim-through at about 15 feet of depth and was festooned by colorful corals, urchins and small tropical fish. 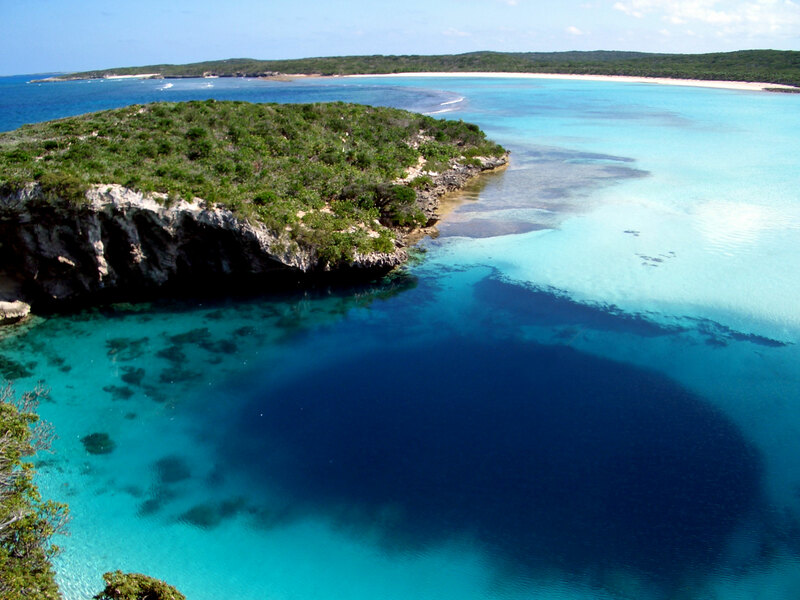 This horseshoe shaped, protected lagoon with its gently sloping sandy bottom and crystal clear water was a perfect place for the kids to swim, snorkel and jump off the rocks. We all spent an entire afternoon there. Some folks walked over the dunes to the next cove, and the next, each uniquely beautiful. I sat in a small patch of shade and drank cold beer, avoiding the sun and enjoying the wind and the crashing of the ocean just over the wall. Another day trip took us up-island to a very large, deep blue hole. This one was tucked into a large cove. The cove was protected from the open ocean by an outer ring of reef that was about a mile away. Again, the sand was white and fine, the sun hot, the water crystal clear. But here, the edges of the blue hole dropped away to 50 feet and more, mere inches from the edge of the water. One could sit in waist-deep water, with their feet on the steep slope and see clearly through the pellucid water. A mere 20 feet from the water’s edge, the bottom was 60 feet down, and it just kept going. Fear of sharks and other unknowns seemed to keep people away from the depths here. It was a spooky place. Only one home was built on the cove. Otherwise, the entire area was deserted. July 4 was the full moon, and plans were underway for 18 clan members to camp on the beach, which the locals refer to as “ranchin'”. Uncle and Auntie took the day off (remember, Independence Day is not a holiday in the Bahamas!). Fresh Bahama bread and mac n’ cheese (a staple) were baked, a huge coleslaw salad whipped up, chicken prepared and hotdogs purchased, in case the men were unlucky in spearing fish at the camping beach. Late afternoon found the caravan at the windy, rocky beach. 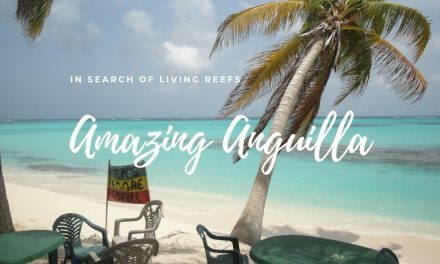 The men grabbed snorkel gear and spears and buckets balanced in tire inner tubes and swam out to the nearby reef. The kids played in the shallows in the lagoon. Women prowled the rocks, prying large “whelks” and “curbs” (we’d call them barnacles) from the rocks for steamed appetizers. In a little over an hour the guys had speared a variety of fish and had grabbed a large slipper lobster and a larger crawfish. The lobster and crawfish were out of season, so they were referred to as “hush-your-mouth crabs”. A search party went out to find some land crabs (ghost crabs in other parts of the Caribbean) but none were found. That’s because they had migrated to the other side of the island, a fact we determined the next day when we ran over scores of these large-as-your-hand crustaceans as they crossed the Queen’s Road, heading back to their spawning grounds. The fire was quickly made in a hole among the rocks on shore. As dusk fell, the kids were brought in from the water: (“Don’ let the shaaks get ya’! Com-in now!”). Foodstuffs in cardboard boxes and small coolers were placed among the rocks. The fish and veggies and spices were prepared and wrapped in foil and thrown on the big grate that served as a grill. Whelks, curbs and the lobsters were placed on the grill and soon we were all stuffing ourselves as the full moon drifted in and out of the clouds hanging low on the horizon. The evening ended as clan members settled into sheets and ground cloths above the high-tide mark. We soon left for the comfort of our air-conditioned motel room. On Tuesday night, we were invited to join the adults at Doc Mel’s “club”, to drink beer and play pool. So off we went, caravanning in the two vehicles. Turns out that Doc Mel’s place was less than 2 miles from the clan compound, and years away from anything Americans might call a “club”. 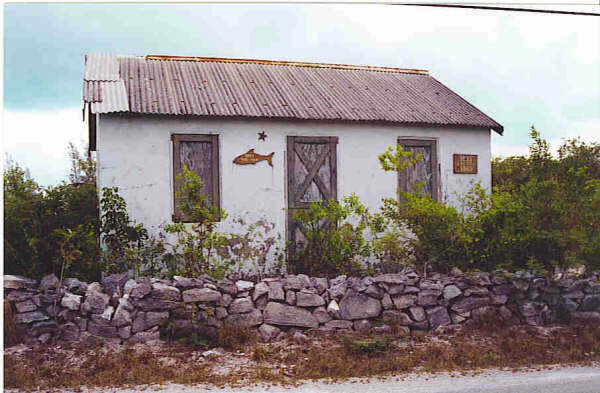 A simple, concrete building painted a bright lime green, Doc Mel’s neighborhood bar features open doorways sporting unfinished 3/4′ plywood “doors”, windowless openings without screens, a bare and unfinished concrete floor and two small toilets, each with its attendant sign crudely written on the unfinished plywood door: “Ladys” or “Mens”. The proprietor himself is a gentle, ageless black man who seemed old to our friend when she was 10! Count on the atmosphere at Doc Mel’s to be warm and friendly. In fact, count on it to be hotter than Hades, with barely a draft of breeze moving across the shrunken and beat-up pool table. But what did we care, we could barely see the balls anyway because the one bare bulb over the table was blown. So we opened the doors to the toilets and used the light spilling out to guide our pool game. A rusty fan tried to move the heavy air around but lost the struggle. Mosquitoes nipped. We passed around the one available roll of paper towels and gamely mopped brows, arms and necks as we slugged cold beer (Heineken or Kalik, awful island brew, or Bud, before we drank it out of stock.) We laughed and played dominos and visited with the one or two locals who stopped by to see what all the commotion was about. The next day, word came to us that special preparations had been made at Doc Mel’s for our entertainment and comfort and we were asked to return. This time, the bulb over the pool table was lit and another fan added to the anemic airflow. A few more locals showed up to laugh at our behaviors, and someone had brought a boom box. Next thing you know it was Electric Slide time and we tore the house down! I’m sure our antics provided fuel for many a story passed through the community. Doc Mels entertainment complex, Long Island, Bahamas. So, yes we had a great time, being embraced as part of a large and extended family. Everyone we met was friendly and helpful. Having traveled the Caribbean, we were not put off by running on island time, the inevitable delays, or silly questions. We learned a lot about how to live on a sparsely populated island with limited resources and were reminded that we are very fortunate to enjoy our standard of living. All too soon it was time for us to head home. Aboard the Bahamas Airways flight, I watched Long Island grow smaller and drop below the horizon and I thought that, of my many trips throughout the Caribbean, this one would linger long and fondly in my memory. Lynn blends a love of independent adventure travel, history and the natural world with over 40 years of experience as an award-winning writer, photographer, creative designer, and producer. When not traveling, she serves as a consultant content strategist and digital marketer for U.S. Fortune 500 companies.